By Toby Ward - If a tree falls in the forest will anyone blog about it? Do blogs beget blog postings? As too many organizations are discovering the hard way, employees don't want to blog. Approximately 1-2% of employees are interested in blogging (today), but most don't have any desire to pick up the proverbial pen. Despite its massive size and extremely technology and web savvy population IBM has found the same problem. About 5% of the employee population blogs on the corporate intranet, but a far greater percentage wants to read employee blogs. In fact, although there are more than 16,000 blogs at IBM, fewer than 900 people (less than one-quarter of one percent of all IBM employees, or 0.25%) have blogged in the past 3 months, according to an internal IBM survey of employees. 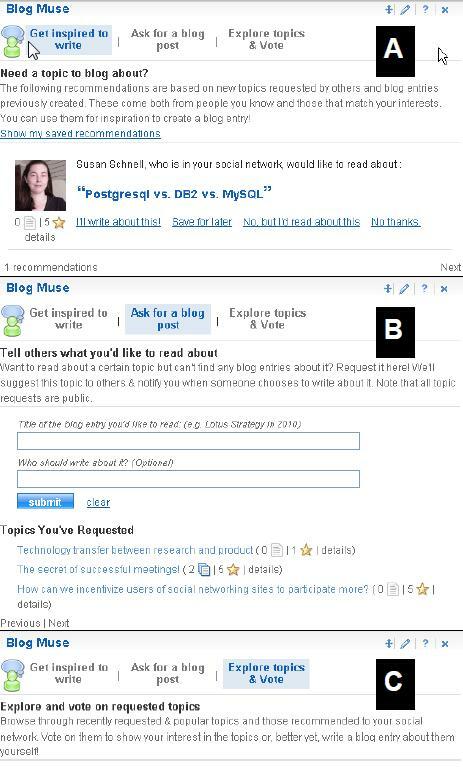 IBM's Blog Muse is a new employee social media tool that connects blog readers and blog writers by allowing readers to make blog topic suggestions and requests of employee subject matter experts who blog at IBM (see below). Employees can “Ask for a blog post” online and Blog Muse will automatically route the topic to those bloggers that are most likely to write about it. If a blog post on the requested topic gets posted then the requester is automatically notified by Blog Muse. Blog Muse also encourages employees to take up blogging via a prominent tab called “Get inspired to write” which recommends topics to readers and potential bloggers. Employees can also search out content by topic and vote on blog posts. The preliminary results (300+ respondents) and data of the Intranet 2.0 Global Survey 2010 reveal that 55% of organizations have employee or executive blogs on their corporate intranet. However, the challenge for these organizations and the owners of the blogging platforms is no different from IBM: you can lead an employee to a blog, but you can't make him or her write. Ensure you get a free copy of the Intranet 2.0 Global Study Report and analysis by spending 5 – 10 minutes taking the Intranet 2.0 Global Survey 2010. Do employees want to blog?